Uber is reportedly considering selling minority stakes in its Advanced Technologies Group, which designs self-driving cars. The move could help Uber to slow its cash burn as it races towards an IPO next year. 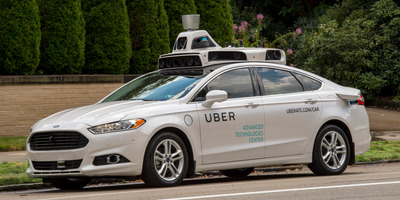 Uber is considering selling off stakes in its Advanced Technologies self-driving unit as it races towards a 2019 IPO, the Financial Times reported Wednesday. Self-driving, the fullest levels of which could still be years away, is a huge liability for all companies, not only Uber. In March, the company suspended its operations after a pedestrian was struck and killed by one of its autonomous vehicles in Arizona. What’s more, the unit burns through $US500 million cash every year, sources tell the FT. Slowing its cash burn is sure to be a major focus ahead of a potential IPO. Both Uber and Lyft are locked in a de-facto arms race towards 2019 public offerings. The Wall Street Journal on Thursday reported that Uber’s valuation could top $US120 billion next year, more than the top three automakers – Ford, GM, and Fiat Chrysler – combined. Lyft, meanwhile, has already secured Credit Suisse’s assistance with bookmaking for its public offering, with JPMorgan reportedly leading the effort and Jefferies assisting. Read the full Financial Times report here.